Repair crane and install tower on the Svinesund-project. 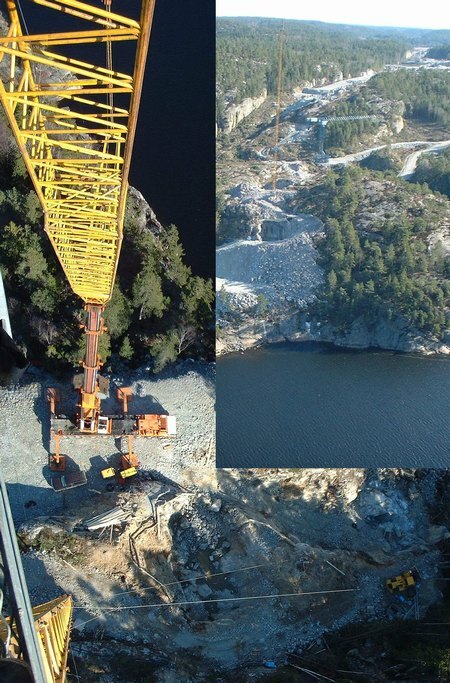 The Liebherr LTM 1400 was on a commission at Svinesund, on the border between Norway and Sweden. This picture is taken from the top of the tower on Norwegian side, about 140 meter above sea-level. 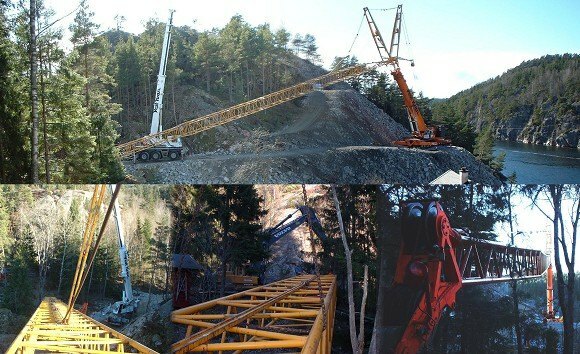 Vestkran A/S from Bergen, a town on the westcoast of Norway, was mobilized with their Liebherr LTM1400, to execute the installation of the tower's. The pictures illustrate's the tallness of the cable-crane. If you didn't like to climb a ladder, you would not be able to assist in this work. From ground level to the top of the tower, there was 250 ladder rung to fight. I did the trip to the top several times, and it was allright if you didn't hurry up. The two masts were both 83 meters high, and the accessible placing of the mobile crane 30 meter below on one side, made it necessary to use the Liebherr LTM 1400 on this installation. The crane was beeing assembled with the 84 m luffing-jib, when there became some problems with the electrical system. My services was requested, and after repair of the crane, I joint in the project, to supervise the operations, and also take part in the installation of the 2 towers for the cable-crane beeing installed. The view from top of the tower is indescribable. From the old bridge at Svinesund, 21 June 2003. Enter this link and visit the web-site Svinesund.no Some pictures below this link, are supplied from the proprietor and webmaster of Svinesund.no, Mr. Bård Halvorsen. 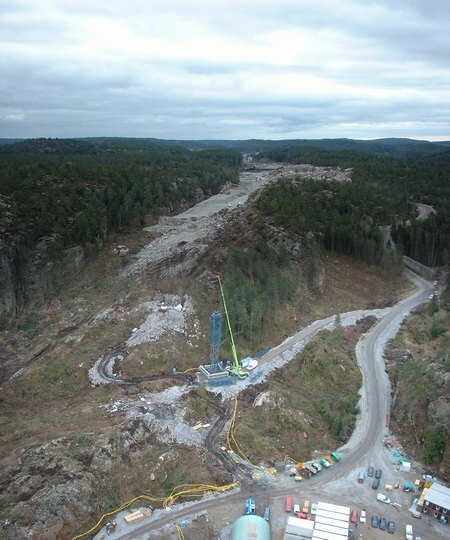 Skailand Kranservice will probably participate in the dismounting of the cable-crane, and supervice in the project, including the procedure with the helicopter-lifting. The demand for security and safety will be of high priority. The date for the helicopter-job, will be announced on this site. Check the web-camera by clicking HERE. and follow the progress.